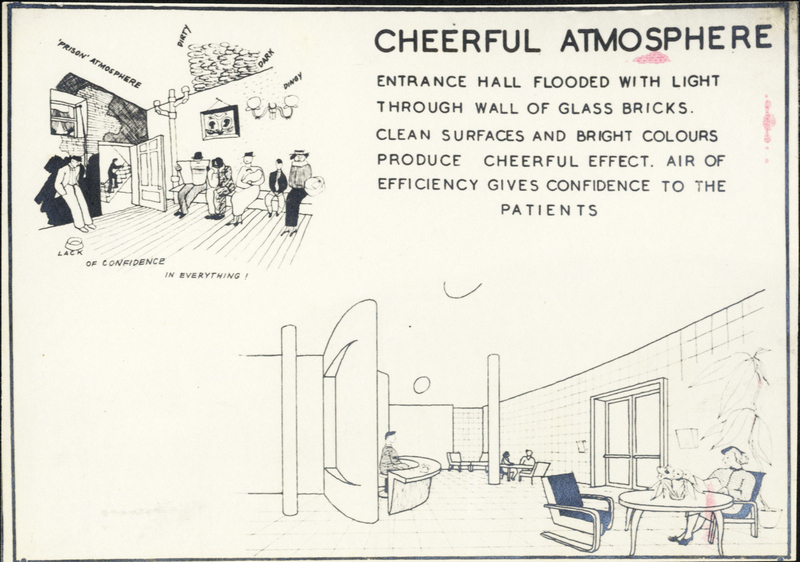 Campaign to keep community health services at, and to get refurbished, Lubetkin's pioneering 1938 building and inspiration for the NHS. Nothing's too good for ordinary people! Finsbury Health Centre will be open for both days of Open House this weekend, 21-22 September 10am – 4pm. There will be a small exhibition of the Cullen cartoons (see one of them above) and other historical material in the lobby, and the rest of the building will be accessible via tours. The tour will go around most of the building except for clinical space and administrative offices, and will include the boiler room, where during the recent upgrade of the boiler the original was kept in place, along with other historic fittings. Volunteers from both the campaign and FHC Preservation Trust will have further information about the building, the new Trust, postcards of Abram Games’ poster ‘Your Britain – Fight for it Now!’ featuring FHC (50p) and copies of Alec Forshaw’s ’20th Century Islington’ (£10) on sale. This will be the first time in many years that FHC has been open for this popular event. The new landlords, NHS Property Services, are very proud of the building (which makes a big change!) and are opening FHC along with their newest health centre in the Olympic Village for the occasion. Do take the chance to see more of the building than usual or just stop by and say hello! The FHC Preservation Trust is also organising a party in celebration of the 75th anniversary of the opening of FHC in 1938. This will be the evening of Monday, 21 October: more details to follow. There will be information about the Finsbury Health Centre Preservation Trust (which has recently received charitable status) and postcards of Abram Games beautiful 1942 poster ‘Your Britain – fight for it Now” available at the Amwell Street Fete this Sunday, 30 June, 12-5pm at the stall in front of Amwell Books, 53 Amwell St. Do come along to support your community and our work to get FHC finally refurbished. Finsbury Health Centre will be part of the Open House Weekend for the first time in about 8 years 21 & 22 September. If you would like to be involved in helping that weekend, get in touch via savefhc(at)yahoo.co.uk. There is a consultation open about a planning brief for the whole of the New River Head site, in the wake of the recent attempt to turn the Pump House into flats. This contraveined an earlier agreement to turn the building into a heritage centre. There is an exhibition about the brief on Thursday June 27 6-9pm & Saturday June 29 11am-2pm at Finsbury Town Hall, and the consultation http://www.islington.gov.uk/services/planning/plan_brief_major/pol_planbrief/Pages/New-River-Head.aspx closes on 8 July. There was the march, and another consultation, now the wait – Clerkenwell Fire Station, the oldest in Europe, and third busiest in London is threatened with closure along with 11 other mainly central London stations under the cuts plans supported by the Mayor a few months ago. It seems obvious from the map of the planned closures that the main metric used was not call-out times but property prices. One important thing all but left out of the discussion of the fire cuts is the fact that a large proportion of call-outs now deal with traffic accidents (also time-critical). You can still write to Boris Johnson to express your disapproval at mayor@london.gov.uk. After having counter-manded two Fire Authority decisions against the cuts he is due to make a final decision sometime in July. The Finsbury Health Centre Preservation Trust is being launched on Friday, 14 December 7.00-10pm in the Reception area of Finsbury Health Centre – with live music, food, drink and a few (short!) speeches, for staff and patients at Finsbury Health Centre and supporters of the SaveFHC campaign. The FHCPT will be working to raise money for and oversee a complete restoration and modernisation of the building, to ensure that Finsbury Health Centre remains at the heart of our community, doing what it was designed for. We will also be celebrating the hard work by staff looking after patients at Finsbury Health Centre, the recent repairs by the NHS, and the many supporters of our campaign who fought for the building to remain open. The 14th also happens to be Lubetkin’s birthday! While we live in a dangerous time for the NHS, coming together in celebration now may also help us protect this most popular of British post-war achievements – largely inspired by Finsbury Health Centre and others like it in Wales and Peckham. Many thanks to Whittington Health and the North Central London NHS for making this celebration possible. It will be a great opportunity to meet the people involved with forming FHCPT and your neighbours, and to see this difficult year out in style. As the building’s architect Lubetkin famously said, ‘Nothing’s too good for ordinary people’! It was an interesting evening at Islington Council’s Health Scrutiny Committee tonight. Not only was physio at FHC discussed, but GP services and performance monitoring, safeguarding of vulnerable adults, news from across the North Central London Cluster and a report from Islington Link were all on the agenda. In the midst of the current chaos, it was good to see there are still some managers left who are still trying to run health services as a public service. First up, the good news for FHC: Whittington Health is, as of next Monday, not only moving Physiotherapy services up to the ground floor, but restoring it to a full 5-day service, covered by not just two actual physiotherapists but three. Beverley Senior, who manages physiotherapy for WH, said that they are working to shorten the currently common three-month wait for appointments there down to no more than a month, depending how serious the problem being addressed is. Bravo to Whittington Health for recognising the demand for physio in the south of Islington and doing something about it. Next, the bad: All NHS property not held by a hospital trust and which has multiple providers of services will pass, with the formal demise of PCTs in April 2013, to a new entity called ‘NHS Property Services’. This will include Finsbury Health Centre. Now this is where it gets ugly: NHS Property Services (NHS PropCo is a although UK government ‘owned’ it is a private registered company one share holder: the Secretary of State for Health. Part of its remit is to make a profit. Although it is not allowed to sell anything for a year, who knows what will happen after that. Local councils will apparently be excluded from rescuing any NHS properties from the clutches of private developers, but there may be scope under the Localism Bill for local groups to do so. But no one really knows yet. What is clear, however – the government is planning a huge theft of public property from tax-payers and communities, and it is time to get busy finding out what’s really going on before it happens. The committee will be looking more closely at NHS PropCo at its next meeting in December. 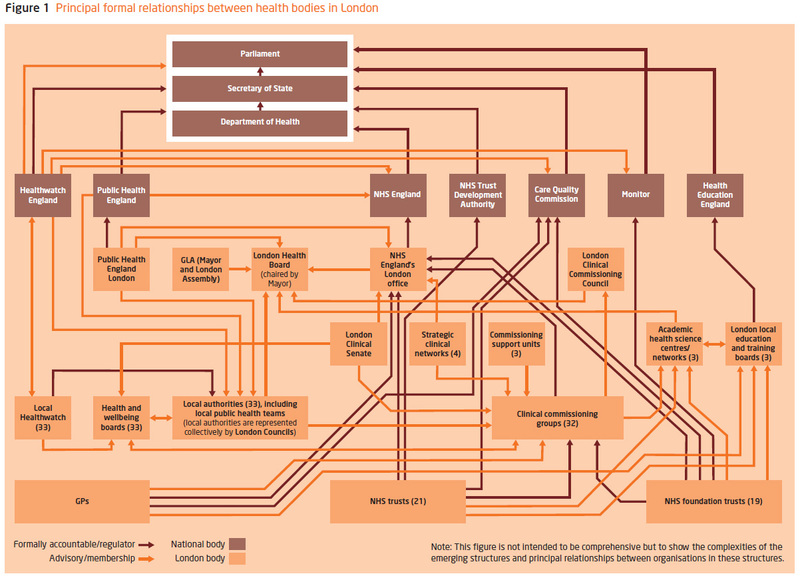 Health services in Finsbury under reform: It’s all good! There was an interesting meeting over at the Finsbury Ward Partnership last week, where the topic under discussion was how local health services will be affected by the reforms approved by the government earlier this year. The meeting drew a range of local residents, voluntary organisations and doctors keen to hear what the local Clinical Commissioning Group (CCG) has been up to and what other delights might be in store for our health services. About 35 people attended. A woman from Public Health set the stage, and we were told we were very lucky to have a whole group of people employed to examine this. Can it possibly be true that most other localities refrain from collecting public health statistics? Gathering information and disseminating it under the new regime will now be fully the responsibility of local councils, no longer shared with the NHS. Cllr Janet Burgess (Executive member of the Cabinet for Health and Adult Social Care) then talked about the new Health and Wellbeing Board, which will be stocked with Cllrs, GPs and other health professionals, reps from HealthWatch, which locally will be the reconstitution of the current patients’ rep body Link. Its purpose is to scrutinise the decisions of the CCG, and if an unresolvable dispute arises it can appeal to the National Commissioning Board (not the Secretary fo State for Health as in the past). Next was what we were all waiting for: an explanation of how the local Clinical Commissioning Group will work. The CCG, working of course in close consultation with absolutely everyone, will commission (that is, buy in) all heath services except those which they don’t. This includes the GPs themselves, prison health services – and something the presenter left out, maternity and early childhood services. There will be only one in Islington, so it will be essentially a neo-PCT, with less control over fewer services. We were shown a fairly simple chart showing the hierarchy of the NHS before the reforms and a much more complicated chart (even after fairly gross simplification) showing 7 tiers replacing the three which existed before, and nearly twice as many CCGs replacing the PCTs around the country. So much for simplifying bureaucratic structure. The CCG will be buying in services from the hospitals and community service providers, and the speaker, a GP at City Road Practice who is Vice-Chair, emphised that the tenders would weighted for quality and experience (thus favouring those formed out of former NHS services) ‘as much as’ price. Veteran health campaigner Wendy Savage queried the claim that services would have to put out to competitive tender at all, in the wake of the judgement in Stroud last spring. In general there was much support for the use of legacy NHS services over for-profit private companies. Former Bunhill councillor Joseph Trotter and others raised questions throughout the evening about the lack of GP coverage in his area, which is served by only one GP practice, where the Clerkenwell side of Finsbury has three. A GP from that practice noted the rather alarming fact that they are signing up 20-30 new patients a day. The new CCG, however, will not be commissioning GP services – the national NHS Commissioning Board will do this. This rather essential body is, however, still ‘in the process’ of formation, with a structure which can still only be guessed at. For the last 20 minutes another member of the CCG gave a rather confusing talk about ‘integrated care’ – basically getting the different agencies talking to each other better and co-ordinate things between them so that the whole burden is not on the patient. No one could doubt this would be a Good Thing, and in fact it has been a stated goal of both the NHS and the Council for some years now, with seemingly little progress to judge from the stories which came from the audience. When asked how this programme was going to square the circle of competitive tendering vs co-operation between services, the speaker gave a rather technical answer involving targets and point scores. Hopefully the CCG will take their lead from the Stroud case and ignore the tendering process altogether. If nothing else it would save a lot of time for our already over-burdened doctors. No doubt we’re lucky that the local CCG seems more concerned with patient care than with promoting the hollow concept of ‘choice’. We need to hold them to it. If you’re concerned about health services in your area, join your practice’s Patient Participation Group, and/or get in touch with Islington Link, which represents patients throughout Islington. If you want to keep track of how the changes are affecting the NHS – and action you can take about them – there’s London Health Emergency and nationally Keep Our NHS Public. By popular acclaim the next Finsbury Ward Partnership meeting will be about housing. While feeling no end of sympathy for the patients and staff affected, it was hard not to indulge in a tinge of Schadenfreude on hearing news that the new Holloway Community Health Centre on Hornsey St is closed due to ‘flooding’. This is where Islington PCT first proposed in 2008 to locate all of the non-GP community services available at Finsbury Health Centre. Now it seems quite fortunate that didn’t happen, despite the at the time ‘self-evident’ truth, to the PCT, that new buildings are ‘much more reliable and easy to maintain.’ People are just naturally resistant to change, they said. You poor benighted dears, they implied, you just don’t understand the demands of 21st century health care. Refurbish a well-made old building and you’ll be able to deal with problems more efficiently, we said, and community health services, particularly those used by children and the elderly, need to be spread better throughout the borough for good access. We didn’t think of: what if that one building fails entirely? Practically guaranteeing that what probably started out as a mole-hill would turn into this mountain, the new health centre is saddled with multiple ownership of the building in which it sits. While the flats above it are owned by Newlon Housing Association, the HCHC is owned by a LIFTco, one of the public/private entities charged with building and managing new community health buildings under the Labour government. Queue squabbling over who’s responsible for repairs affecting both, natch. Nothing can be done to fix the problem until there’s an agreement about who pays. This has become a big headache for Whittington Health, the NHS trust which manages the community health services at HCHC and Finsbury, and the North Central London NHS, who, as the representatives of the rump of five neighbouring PCTs is responsible for dealing with the buildings like FHC which the NHS still owns outright. It seems that while both landlords deny any responsibility for the flood there’s little room for negotiation. How either can rest easy with these denials in the face of such huge public inconvenience, it is difficult to say. Neither is displaying any duty-of-care towards the people in the buildings they are contracted to manage. Apologies for yet another ‘I told you so’ moment, but SaveFHC campaign was also highly critical of the LIFTco model. PFI deals like a LIFTco leave the NHS not only responsible for spiralling costs. We also pointed out that LIFTco’s interest in maintaining the buildings they own would be minimal, under their 30-year hand-back agreements, whatever else was said in the contracts. Although how a LIFTco could be worse than the local NHS on building maintenance, we also couldn’t quite imagine. Until now. Meanwhile broken appointments stack up, pain goes unrelieved, conditions undiagnosed and untreated. At this writing I don’t know if FHC is picking up the slack. At least NCL’s current estates managers are trained surveyors who actually understand and like buildings. This is a very welcome change, albeit in the twilight of its existence. I can only wish they and Whittington Health luck in sorting this abysmal situation out. As much as it is hard for us in Finsbury to get up to Hornsey St, many living in that area will find it difficult to get down here. Islington Council’s Health Scrutiny Committee will be hearing an update on the Finsbury Health Centre from North Central London NHS at their meeting on Thursday, 24 May in the Town Hall on Upper Street, 7.30 pm. The Michael Palin Stammering Centre has moved next door, freeing up space in FHC. While blood testing has been a welcome addition, services like physiotherapy and sexual health which were due to move upstairs to the more accessible ground floor still have not done so. It seems that while windows on the south side were painted, they weren’t made weatherproof, a frustrating sitution for staff who had been looking forward to finally having computer access up there! There are also continuing problems getting physio appointments at FHC due to understaffing. Philip Allwyn and Martin Machray, respectively Chief Operating Officer and Communications Officer at North Central London NHS (the cluster of five borough PCTs which replaced the local trusts) will be appearing. The meeting is open to the public, so do come along to ask questions and make your views heard.